The teeth usually called “wisdom teeth” are in fact third molars, and they are typically the final four teeth to emerge from the gums. For most people, their wisdom teeth erupt when they are somewhere between the ages of 17 to 25 years old.This stage in life, the end of adolescence and the beginnings of young adulthood, often brings a new level of maturity, which is where the name “wisdom teeth” originates. Why Do So Many People Have Their Wisdom Teeth Removed? First of all, not everyone has to have their wisdom teeth taken out. But it’s true that this is a very common procedure. Harm to other nearby teeth. Soft tissue impaction – the top of the wisdom tooth (aka the crown) has come up through the bone, but it is partially or even totally obstructed by the gum tissue. In these cases, the patient often has a very hard time keeping the area clean, leaving them vulnerable to food getting stuck below the gum, which can lead to tooth decay and/or infections, both of which are quite painful. Partial bony impaction – another type of impaction that is particularly susceptible to infection. In these cases, the tooth has begun to make its way out from below the surface of the bone, but part of the crown is still located underneath the gingiva, or gum tissue. 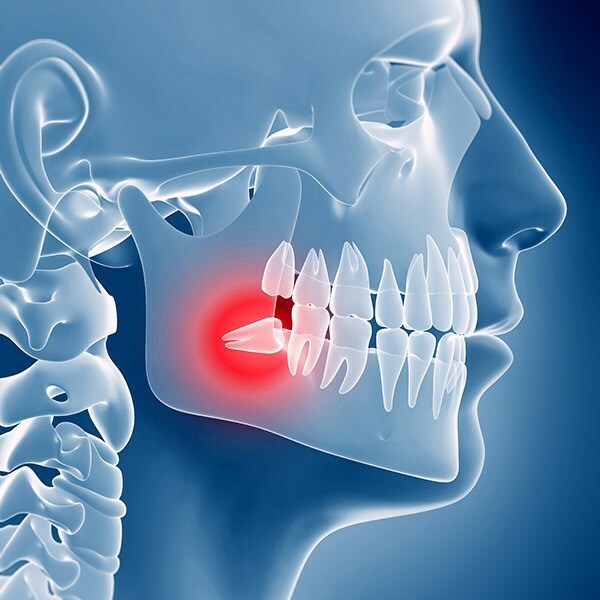 Complete bony impaction – this means that the wisdom tooth has not erupted at all from the jawbone. In these cases, getting at the wisdom teeth in order to remove them is much more complicated, and so such cases require a different approach. Our dentists here at Empress Walk Dental recommend wisdom tooth removal in cases where the patient is experiencing active discomfort, pain, decay, infection, and/or swelling, and in some cases to prevent these symptoms from occurring in the first place. I Have At Least One Impacted Wisdom Tooth. Why Not Just Leave It Be? Tooth crowding – some people think that impacted wisdom teeth can put pressure on the other teeth that have already erupted to the point that they become misaligned or “crooked.” There is no universally accepted dental opinion on this theory, and no scientific studies have ever proven it to be true. However, since many people do believe this, we find it worth mentioning here. Infection – when food and bacteria get stuck underneath the gums, infection can occur. Infections are, of course, usually painful and sometimes dangerous. Disease – in rare cases, the parts of the mouth near the impacted wisdom tooth can develop tumors or cysts. Damage to neighboring teeth – this is a fairly common issue where the second molars, which are located next to the wisdom teeth, are damaged through their proximity to the impacted tooth. Some of the ways that the second molars could be damaged include gum disease, cavities, and even bone loss. Before your Empress Walk Dental dentist makes a diagnosis and treatment recommendation, a comprehensive examination of your mouth is necessary so that the dentist can look at the wisdom teeth and the teeth surrounding it in order to determine whether or not there is a need to perform the removal, whether that is to solve an existing problem or prevent a future one. In order to get the full picture of what is going on, your dentist will take digital or panoramic X-rays to check out the positioning of the teeth, etc. as well as any other underlying issues that would not be immediately apparent in a visual examination, such as tooth decay or degradation. At Empress Walk Dental, we typically recommend that our patients be evaluated early on for wisdom teeth issues – ideally, in their mid-teenage years. Catching problems before they become especially serious is the best way to prevent more widespread damage and achieve the optimal results from treatment. Keep in mind that a comprehensive exam is the only way for patients of any age to know the full extent of their situation and for your dentist to make appropriate treatment recommendations. All of our Empress Walk Dental dentists who perform wisdom teeth removal surgeries have been specifically trained to do so and have plenty of experience in the field. No overnight stay is necessary. Once the procedure is over, we will send you home with instructions on how to best care for yourself during your recovery. If you require any medication for discomfort/pain or swelling, we will provide that as well.